You guys. The worst thing that can ever happen happened today. Snowmageddon hit Salt Lake City. WHERE I LIVE. Bob woke me up this morning with his routine phone call he makes to all four of his children throughout every winter, informing us that it snowed and asking us not to live our lives by going outside or doing anything whatsoever. Cathie can usually be heard in the background yelling redundant instructions. I informed Bob that I would probably just work from home if it really was all that bad and he congratulated me for my wisdom with a tone in his voice like he was considering nominating me for family member of the month, which is a really difficult thing to win in any family in which Cathie resides. I looked outside and discovered that more snow had fallen over night than all of last winter combined. I actually don't think that's an exaggeration. Can I get an amen from any of my SLC brothers and sisters? For reasons I spent the remainder of my day trying to figure out, I decided to attempt to drive to the office rather than just work from home, which was a perfectly viable option. My 10-minute or so commute was transformed into 90 as all 17 billion people who live in Salt Lake lined the road from my house to the office, panic-stricken, and regretting all of their life choices. By the time I got into the office, I felt like I had to really make the trek count and so I had probably the most productive day I've known in my 31 years of living. It never stopped snowing. And it still hasn't. I was supposed to go to a friend's house in the evening and had forgotten that he lived on top of a hill. I was able to get to his neighborhood but the moment I reached the bottom of the hill, my little car started sliding to-and-fro before crashing into a snow bank. I exited the vehicle and finished the journey on foot. I was exactly like the pioneers when they had to leave their oxen behind and continue the journey with nothing but the clothes on their backs. I GUESS I'M GOING TO BE PRETTY READY TO CELEBRATE PIONEER DAY NEXT YEAR. A complicated and difficult process of using a friend's truck and chains to pull my car out of the snow bank took a good portion of the evening before I finally returned to my neighborhood around 11:00. I looked at The Perfects's'''s'e's's's sidewalk. Then I looked at mine. My driveway had about a foot and a half of snow. My world-record setting incredibly LONG and exceedingly narrow driveway. There was no possible way to get my car onto it and I couldn't park it anywhere else because the streets were lined with high snow banks from the many plows that came through during the day. And so I began a 90-minute snow-shoveling disaster. You guys. Do you know how long it takes to shovel the world's longest driveway? Also, I never noticed that my driveway is basically a 90-degree angle. It is SO steep. I know this now because I fell and slid down it eleventy times tonight, screaming obscenities into the cold muffled street each time. NOT THAT WE KNOW ANY OBSCENITIES, CATHIE. 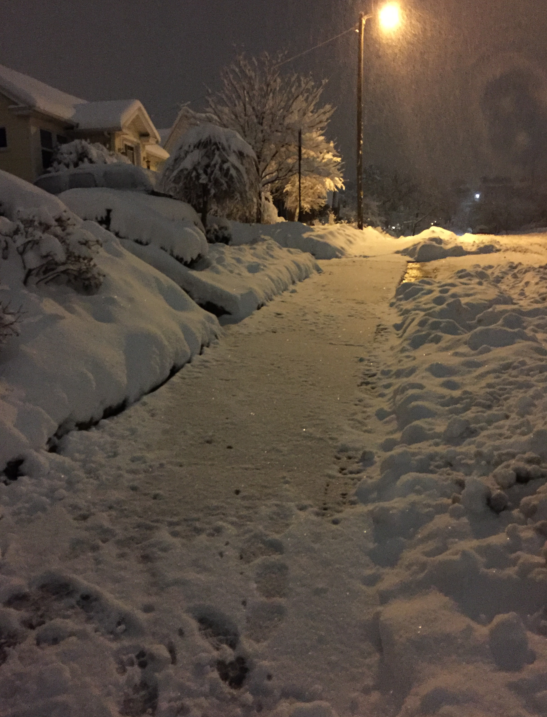 By the time I had sufficiently shoveled it, it was nearly midnight. I took my car around the block (because I couldn't drive up the hill to the driveway entrance due to the fact that my car is not a snowmobile). I slid around a tight corner, made a sharp turn, aimed for the narrowest driveway in the history of driveways, and gunned for it. I slid to-and-fro. I crashed into snow banks. My driveway was too steep to get my car up onto it. Eventually I abandoned it on the sidewalk, well aware that The Perfects are going to see it in the morning and have a new reason to judge me. You guys. It is STILL snowing! AND I THOUGHT THIS WAS SUPPOSED TO BE AMERICA! Oh come on Perfect's's's's's, who shovels sidewalks in the middle of a snowstorm? These people are like some kind of perfect aliens. When we bought our newest house, one of my requirements was "can get up driveway when it's snowing." We would pull up to a prospect and not even go in, I would just say, "nope, driveway too steep." Please send me the snow. I really need that much snow so that I can go skiing. The grey and brown yucky look outside is not nice. Why do people call it a "green" Christmas when it's not green at all??? That sentiment exactly is stated in one of the Anne of Green Gables books. I only mention it because I read about it only a few days ago. As New Orleans is currently in the 70s, I feel slightly jealous of the wintry weather, but only slightly. Snow is not my favorite. I feel your pain. Nearly 70 in Bflo, NY yesterday. I need Snow. I need to ski. This isn't right. My husband turns into a crazy person when it snows. He is out shoveling the second it starts. Someone actually asked if our driveway and sidewalk were heated because there is never any snow on it. Once when a neighbor made the mistake of parking their car in the street during a snow ban he was so angry that the snowplow couldn't properly clear the end of the driveway where the street meets it. He took all our driveway and sidewalk snow and buried their car. This is a man who in my 13 years of knowing him still doesn't know how to use the vacuum or turn our washer or dryer on. But the second it snows he becomes Mr. Snow Showoff. Kaci, your husband is my hero for burying that car. I would high five him right now if I could. Keep your snow - I'll take a gray, brown, and yucky 50 degree Christmas over a white one any day. Amen! Except I'm glad that Utah is finally getting some good snow. Last year was absolutely pathetic Utah snow sport lovers. It was 70 degrees in Virginia yesterday, and it is 65 right now. I walked to the courthouse without a jacket and the landscapers had just mowed the grass. It felt and smelt like spring. SPRING. A WEEK BEFORE CHRISTMAS. I'm just going to say this right now. I hate you Brandon, and everyone else that lives in sunny Virginia. The end. I can't believe I'm saying this but I agree with Lee, Brandon do you have a death wish? You say you want this weather, but you weren't up at 6am shoveling your driveway and sidewalk this morning. That's okay. I still love you, Lee. And if Trump becomes president, maybe I'll even move up and be your neighbor (Canada will be accepting American refugees, right?). We can sit on our igloo-porches and make fun of the Americans who come up in the middle of summer looking for ski slopes (my Nova Scotian friend actually had people do just that...more than once). The Suzzzz, I grew up in upstate New York and lived for 10 years in Utah. I want my cold December! I'll welcome the unseasonal warmth in February, but 70 degrees in December is not the proper way to remember Jesus. It was snowing in Bethlehem, right? A white Christmas is charming, as long as you don't have anywhere to go and someone else to do the shoveling. If I didn't have to leave my house today I'd be reveling in the view outside the window. Oh and it was totally snowing in Bethlehem and there was a Walmart next to the stable so that Joseph could pop out and grab some diapers and a "
push gift" for Mary, because Christmas is all about obligatory gift giving. Brandon, I'm sorry for that time I called you a hippie and told you to cut your hair when we were all doing genealogy together a few months ago. Your comments made me laugh. WHILE THERE'S SNOW OUTSIDE. If this isn't a Christmas miracle, well then I guess this isn't even America anymore. Punishment? Or reward? Go USU! Eli, all is forgiven. Now if you could return the favor and send some Christmas miracle snow my way next week, that'd be great. kthxbye. Seriously Brandon - you may be making Eli laugh but the rest of us want to pummel you . . . . if you want cold weather - don't live in Virginia! LOL...I almost had tears in my eyes from that comment. Sue Ellen - I'd be mad at you too except my flight to Florida is on Monday and I'll be there enjoying your 80 degree weather for a week so YAY for Florida! Logan didn't get as much snow as SLC but in all honesty I think you're right, this one storm dumped more snow than all of last winter combined. Now that you're a homeowner you should probably get a snowblower...you could be that jerk that shoots the snow from your driveway over onto the perfects's's's's's freshly shoveled walk and then be all like "How on earth did that happen?!?!" when they glare at you accusingly. At least the sun is coming out now. As a South Louisianian, I'm enjoying a 75ish degree day. All Strangers are welcome. OOOOOOOOOH YEAH!! Now I remember why I moved back to California! OMG Karen...this is why we don't invite you to parties. Oh hey, 2 things. Tomorrow is garbage day...good luck with that. And you might want to find a way to get all the way in the driveway before the cops give you a ticket for blocking the sidewalk, not that we know what TICKETS are Cathie. Let me get this straight...you got home at 11:00, shoveled for 90 minutes, and by the time you were done it was ALMOST Midnight? What kind of warped time continuum destroying vacuum do you live in? FYI, we're getting your crappy snow tonight. The only enjoyment I can get from all of this is that shoveling that junk tomorrow is going to blow some time from this week so that Friday can get here faster so I can watch STAR WARS!!! People don't come to Stranger for accurate information, Lee. That's what the mommy blog is for. A) Please - both of you - keep your snow away from Michigan until at least the 21st and if it must come them make it go away before the 28th (I'm in Flordia between those dates - I don't care what happens in Michigan). B) Lee - if you post ANY Star Wars spoilers I will hunt you down and skin you alive. @Eli, apparently not. FYI, I need you to write a blog every day this week...maybe twice a day, so I don't read anything anywhere else regarding Star Wars spoilers. You need to keep me entertained so that I stop thinking about it and the time passes by quickly. So start typing. Nicole I give you premission to hunt Lee down for spoilers, but only if you get someone to film it. I'm picturing the Dolly Parton fantasy boss hunting scene from 9 to 5. @The Suzzz - I think i can work with that. OMG SPOILERS ALREADY EVERYWHERE!!! It's like I'm supposed to just go through my day with my eyes shut. I can't even read the newspaper. ELI! Where is the blogs you promised you'd write for me?!?! I'm sure you promised...I think you used telepathy to tell me you would. I am not strong enough not to read all the juicy SPOILERS!! I'm going to give in to the dark side! Here I'll distract you with spoilers from a different movie that I just saw last night. Apparently dinosaurs discovered how to cultivate land, speak, and use tools. Humans stole all our technology from them while pretending to be their friend, then said human just walks away to be with other humans like "as if". That should tide you over until Star Wars. There's a Google Chrome extension that will hide all Star Wars spoilers. I was going to install it since I won't get to the theater until at LEAST next Wednesday (but now work says I have to come in, so it may not happen after all), but now I think I'll just set people on fire if they spoil things for me. Equally efficient, and so much more satisfying! I'm visiting family and their house is in a hollow. Meaning the only way out to the neighborhood is to go up a hill. There are 3 outlets, all 3 steep. I don't plan on leaving for a while. I love snow when I'm warm and bundled and intentionally being in it. Hate driving in it. Doesn't it make you wish you lived in Palau again?! Perhaps swimming in this beautiful lake?? https://www.facebook.com/nbcnightlynews/videos/10153864180533689/ I can imagine you swimming here...seems right up your alley. My husband and I lived in Chicago for 15+ years and shoveled snow and more snow and more snow. (It just would never go away - even in summer! [sob]) We then moved to Alabama for 7 years, and now live in Texas. I don't ever ever ever want to see the white stuff ever again, much to the dismay of our two daughters. Good luck with that, and don't mess up your hair as you are sliding down your driveway! I feel like this is turning into the Suzzzz and Lee show lol! I picture Eli standing hands on hips, gorgeous hair, with the Suzzzz and Lee flanking him with finger-guns drawn! Lol! Sorry, this is what happens when I'm stuck on hold for extended periods of time while at work. I should have called in sick and stayed home, but instead I'm here, being all distracted. I'm with you. Half of our appointments didn't show this morning (though it's picked up a bit as the day has gone on). I live in Northern Illinois, and for what I'm pretty sure is the first time in my 20 years alive, we have only had snow once, and it is all melted. Every other year of my life I have wanted snow in December, but this is my first year away from home for school and I do not want to drive in that deceptively, sparkly, fluffy, white death trap. If you care about your strangers at all keep the snow, perform a sacrificial ritual to the snow god if you must, dig a 100 foot hole for all the snow to fall in, just do not share it. When it comes to snow sharing is not caring. We, here in Minnesota, just laugh when you guys all talk about snow. You know.... If they really are the Perfects'ssss they would have shoveled your sidewalk and driveway too. Because... That's what perfect neighbors do. Maybe we should start calling them The Selfishes! Ooooh yes, I second the nomination. Look at it this way, you get to one up them! Shovel the crap out of their driveway! I feel your pain Eli. Or more accurately, my back does because I too had to shovel a foot and half of snow yesterday. We are Canadian Snowbirds. The reason being....we got tired of 10 months of winter. We found our perfect spot in California, (a 400 sq ft park model) went home and sold our house (no more grass cutting or snow shoveling) Bought an apartment condo (we can only be in USA for so long) and now I cringe at the thought of snow. Love ya Eli, you make me laugh all the time. Oh Lee, I think you and I were separated at birth, you little ray of sunshine you! The movie Twins might as well be about us. Like looking in a mirror...can I be Arnie? From now on I'm referring to you as The Danny Devito, k? Ok. Okay - disturbingly I didn't realize at first the Twins you were talking about and I pictured the twins from Children of the Corn . . . . I'm apparently in the minority, because my idea of heaven is to be snowed in all year long. I would give anything for your snow. Let's switch. You can have the 65 degree Ohio Christmas and I will GLADLY take your Utah snow. I'LL EVEN SHOVEL FOR YOU. I agree!! I moved from Idaho/Utah to California recently where it is painfully beautiful every single day. After months of 65 and sunny, I told my husband "I just wish it would rain!!" (drought aside) and he responded "I know, the sun is making me depressed." It's been over 20 years since I lived in Utah (yeah, old, get off my lawn!) and I still have some sort of PSSD--Post-Snow Stress Disorder. Every time I see a steep driveway, I still think: How do they get up that in the snow? (For the record, it has snowed once in the 15 years I've lived in AZ--last New Year's Day. I had to film it, and you can hear me cussin' on the video). Y'all Utahns can keep those piles of snow that stick around until June getting dirtier and dirtier, thankyouverymuch. I'm still crabby about the one time they canceled school in SLC because it snowed 3 feet of snow overnight, 3 feet! And my mom made me walk to school in it anyway (because SLC never cancels school because of snow) just to get sent home. And lest I sound too old and grumpy, enjoyed reading about your experience very much, Eli :-)). Maybe a little too much buahahaha! My daughter recently married an American in the Air Force. They were supposed to be posted in Shreveport so she left Canada and left all her winter things behind. She was looking forward to not having winter for once in her life. She was there for a month and then they were posted to Ogden, Utah. I had to pack up her coats and hats and scarves and mittens and boots and quickly send them to her. On Monday at 5:30 IN THE MORNING she started sending me pictures of her snowy backyard and I sent her back pictures of our grass. For some reason, it has been unseasonably warm this year up here in my part of Canada. Last Friday it was a balmy 15 (celsius--I don't know what that is in Fahrenheit, someone else can do that math). So she is not quite a happy snowed in camper and feels a bit cheated. Although I'm quite content with this turn of events. El Nino is causing the nice weather this year up here. I live in Manitoba and it's been nice. We are right now, however, getting the snow they just got in SLC, and it's going to get a bit colder, nowhere near how cold it normally is though. PLEASE keep it there. It has been extremely warm here in Philly. It actually hit 70 degrees the other day...in DECEMBER! It was in the mid-60's yesterday too. We haven't gotten a cold snap yet...and I'm ok with that. I just hope we don't pay for it later and get bombarded like we did the last 2-3 years. My last name is White, and I sat my husband down and had a talk about changing our last name back to my maiden name because I was so sick of seeing white everywhere. Of the last 57 comments, 12 have been from The Suzzzz. And since when did Eli start sensoring comments? She must be getting slow in her old age. Kidding Suzzzz. Actually I think I'm older then she is. Slow day at work, so sue me, must be a slow day for you Anonymous that you actually went and counted all the comments. What's this censoring you speak of? Or is Sensoring something that has to do with sense, because if that's what you're looking for you're in the wrong place. For the record Lee I am 29 1/2 forever. Sure Hilary, if you say you were arguing with "someone" then I guess it must be true. I totally believe you when you say they "deleted" their comment. Where is non-crazy land? I can't see it from here. It's not in Virginia, I can tell you that. Hilary - I actually did that once - went back and deleted all of my comments in the argument just to make that person look like even more of a moron than they already were. Down here in St George we are getting tired of shoveling all that sunshine and it's really annoying to have to wear sunglasses outside so the sun doesn't get in your eyes. I might even have to get my jacket out this week. Darn weather. Hollie...you know where you can stick that sunshine right? ...but seriously, we hate you too. Haha :-D No worries, I can handle it. Hang on while I get my sunscreen on before heading out...safety first! Hollie, you've got a spare bedroom I can crash in, right? Nevermind, I'll just bring a hammock and sleep out in the yard. Uhh...that's my spot Suzzzz...find your own spot in Hollie's yard! I'M TELLING! Lee, so help me I will short sheet your hammock if you hog my spot. Come on over! My kids have a little play set in the back you could even stay in. But just a heads up, the pirate steering wheel doesn't really steer the play set, that was a huge disappointment. But the attached binoculars kind of work. You asked for an Amen from your SLC brothers and sisters. So Amen. Snowmageddon 2015 was ridiculous. And legit more snow than all of last winter. Every winter should be like last winter. Yes, but then every summer would be like last summer, when wee couldn't water our lawns, and had to feel guilty for getting a drink of water. Its a trade-off. I'm just going to put it out there right now. Those of you wishing for snow have either forgotten how awful and terrible it is and how much you want to just take a flamethrower to your driveway to get rid of it because it feels like winter is going to last FOREVER, or you have never experienced having to deal with it in your life (and when I say deal with it I mean actually have to shovel/drive to work wishing you had a tank so that you could just drive over other people's cars). Sure it looks pretty when your lights are lit up and everything is shoveled, or when it's falling and you have no where to go...or if you want to go skiing. But when you're standing there with a shovel/snowblower looking at 5-6 inches of snow that just fell, you wish right then and there that you could be a nomad and move to Mexico for the winter. And then when you wake up the next day and open your garage door only to see another 3-4 inches of snow on the ground...AGAIN...you just start to cry....and then drive down to Hollie's house and live in her back yard and never leave. STAY OUT OF MY SPOT SUZZZZ!!! It's never pretty - it's monochromatic - until it's not and then it's gray and white and slushy - and it's ALWAYS ALWAYS cold . . . . I'd actually love Michigan if it didn't have snow . . . SPOILER ALERT: Luke and Leia are twins, and Darth Vader is the baby-Daddy. It's been so cold here in Los Angeles that I have actually had to dress in LAYERS so that I can be comfortable in my flip-flops and t-shirts once I get inside whatever building I'm in. Also, my stupid landlords won't heat the swimming pool through the winter, because they don't think anyone will use it. Stupids. Hate snow. Have always hated snow, even when I never had to shovel it or drive in it or do anything like make a snowman. This is why I live in "sunny" California. Before we escaped North Carolina last year, though, the Boy (El Niño) wanted to remind us why we wanted to escape, and dumped the absolute worst winter on us at least three times. We lived 25-30 miles away from where we worked, and drivers in the south are THE WORST when the white stuff falls. I'm including myself in that equation (southern drivers = "the worst"). Hate snow. You best be looking over your shoulder emelle - I will find you . . . .
For my whole childhood I thought that it snowed everywhere except for Florida and Hawaii. Which come to find out, is not the case. I greatly appreciate that pie, I hope it's the grape flavor. And now I can finally say to people, "Why in the hell should I stop eating WHATEVER it is in my pie? I think PEOPLE need to mind their own business. I don't care if it was heroin in my pie. It's in MY PIE. F**k you." And me and Lil Wayne will cheers with overcoming adversity/haters. I'm so jealous whitegirlsbelike is getting a Robitussin pie! But I'm ever thankful to Eli because I don't think I'll ever forget how to spell Robitussin again! I like this font for your website much better. Just so you know (but I secretly liked how it looked before you did the most recent update so I guess, according to Matt, I have bad taste). Me too Hilary . . . .Me too . . . . I don't know about sarcastically, but a lot of people use them up in Canada. I recently became aware that my friend Greg met you EVEN THOUGH I'M THE ONE THAT'S BEEN OBSESSED WITH YOU FOR TWO YEARS AND ALWAYS PRAYED TO THE QUEEN OF COLORS THAT I'D RUN INTO YOU WHEN I WORKED IN SALT LAKE. The universe is a cruel mistress. What I'm trying to say is, you are my spirit animal and I loved this post, as I love every post you ever write. Geez, what a brown noser. She's trying to steal your thunder like that girl who fixed the popups on the website Lee - see, I can't even remember her name now - don't worry - This one will fade into oblivion too . . . I live in Mexico, but in a higher mountainous part, so in the winter the highs are in the 40s and 50s (which I know is nothing compared to my parents in Michigan or Lee in Canada or my friend who lives in Yekaterinburg, Russia; I'm just mentioning that so you don't hear Mexico and assume I'm at the beach right now). ANYWAY, everyone was SO excited that it snowed earlier this week. Possibly the same day SLC was dumped on. But by snow, I mean there was ten minutes of blink-and-you-miss-them scattered flurries with nothing sticking. But there was still much excitement and Facebook posting about the snow. They are pretty fascinated by snow here. Too bad you can't send us some. Mmmmmm . . . Margaritas . . . .